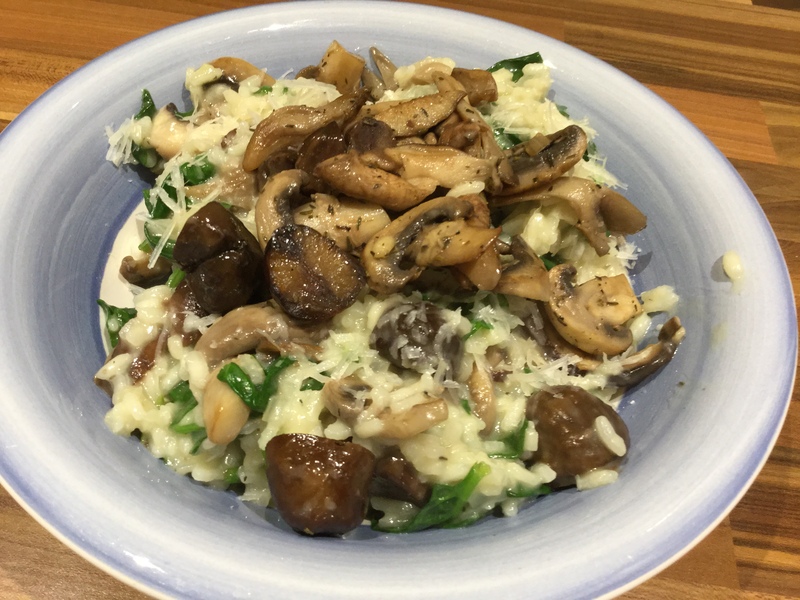 Risotto is one of our favourite go-to recipes at Season’s Eatings. During Autumn, wild mushrooms and chestnuts are more readily available and are a delicious combination of flavours when used together. We combined a mixture of shiitake mushrooms, oyster mushrooms and a handful of closed cup ones. Any mixture of mushrooms will work, so feel free to use your favourites, if you don’t like our choice or if can’t get hold of the above. Although this is a vegetarian dish, a few fried bacon lardons or cubes of pancetta would be a delicious addition. The recipe serves 2-3 greedy people and can be multiplied up easily for bigger numbers. 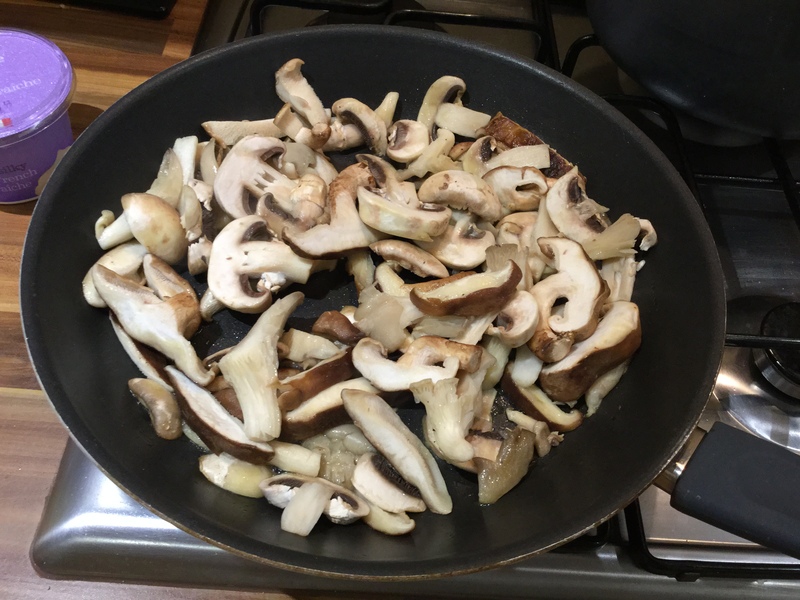 Firstly prepare all the ingredients: finely diced the onion and slice up the mushrooms into 1cm slices. Also make up any stock with hot water if you’re using a cube. In a large saucepan, add a tablespoon of garlic oil and a large knob of butter. Put the pan over a medium heat, and once the butter starts to foam add the onion and turn down the heat. Stir around until the onion is slicked in the butter and oil and leave to become translucent, which should take about 5 minutes. 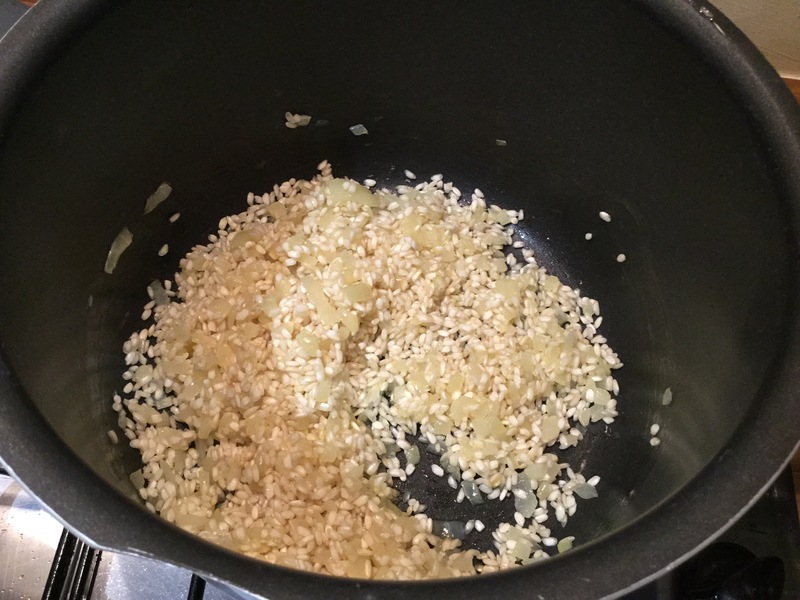 Once the onion is ready, add the risotto rice and stir through the onion mixture. Spoon in a couple of ladles of the chicken stock and leave to absorb. Repeat this until all the stock has been absorbed. This will take about 20 minutes. Whilst you’re topping up the risotto, in a separate frying pan add another tablespoon or garlic oil and knob of butter. Tip in the mushrooms and turn the heat up to medium. 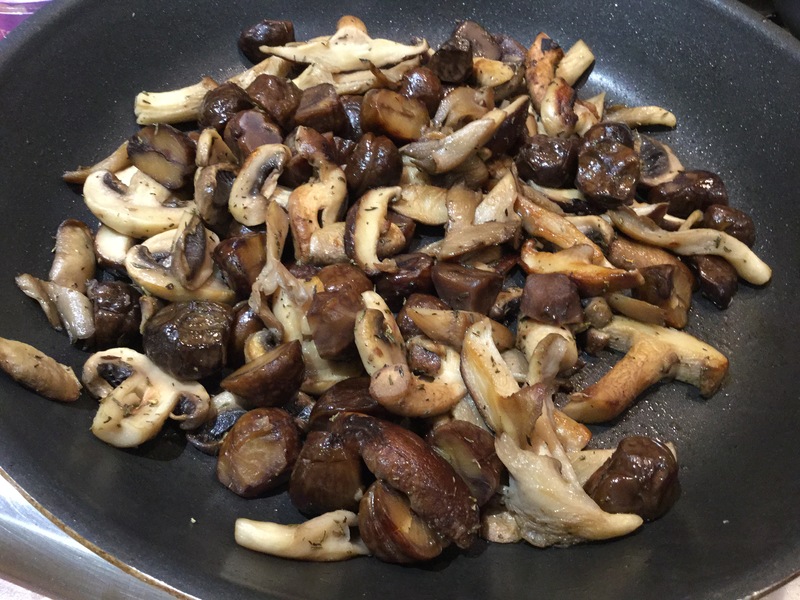 Push the mushrooms around to ensure that each strip of fungi is coated in some oil and butter. Leave to cook until they get a bit of (golden) colour, which should take about 10 minutes. Note that if you overcrowd the pan, the mushrooms will not brown, so do this in two batches if your pan isn’t big enough. Once the mushrooms have cooked, add the chestnuts and thyme. Turn the heat down to medium-low, give another stir and leave for another 5-10minutes to allow the thyme to infuse some flavour and chestnuts to reheat. Once the last ladle of stock has been absorbed by the rice, turn the heat off and tip the spinach leaves into the pan. Stir in and the residual heat will cause the leaves to wilt. Add the parmesan and seasoning to taste at this point. Finally stir in the mushroom and chestnut mix.